Pictured from left to right, apprentices Brian Meyer, Duane Erickson, Harvey Hussey, Slaveck Moraru and Lurelee Lorenzen make up the 2013 graduating class of the IAM/Boeing Joint Apprenticeship Program in Seattle. A new Machinists News Network video showcases the 2013 graduates of the IAM/Boeing Joint Apprenticeship Program. For nearly 80 years, the IAM and Boeing have worked together on an apprenticeship program in the Puget Sound area of Washington State. 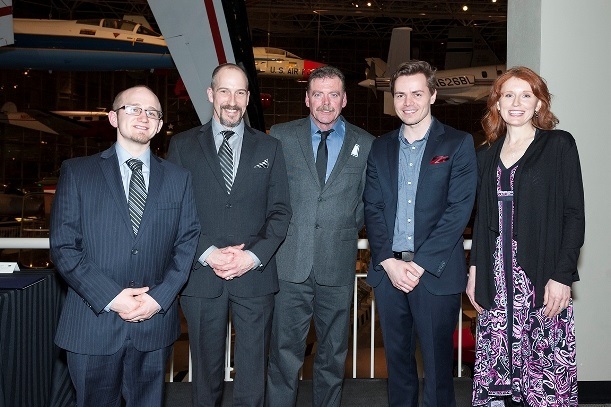 Six apprentices completed on-the-job training and were recognized with a graduation banquet at the Museum of Flight in Seattle on February 7th. Graduate Brian Meyer received the Arnie Durall Achievement Award for outstanding scholastic and on-the-job training performance. Five of the six graduates in attendance received completion certificates from South Seattle Community College, Washington state, the IAM and Boeing, along with lapel pins and some welcomed advice. Click here to watch the IAM/Boeing Joint Apprentice Class of 2013.